Summer's the perfect time for a family vacation, but what do you do when your four-footed family member isn't welcome at the hotel, camp site or a relative's house? You'll need to decide whether or not Fido will be hanging out at home or boarded while you're gone. Regardless of your choice, planning is key when it comes to both you and your pet enjoying a much-deserved break. "Book your pet sitter early," suggests Trish Anselmo, owner of TLC Pet-Sitting & Errand Service (310-8610). The best sitters are booked well in advance, and you don't want to leave your precious pet with just anyone. "Your pet's welfare, health and safety should be a sitter's first priority," says Anselmo, who is pet first-aid and CPR certified. Because your pet will be lovingly cared for, walked and played with on their own turf, their anxiety about you being gone will substantially diminish. And, since your pet is cared for at home, you have one less thing to worry about, too. "Our services give your home the security of a lived-in look. We take in the mail and newspapers, put out the trash, turn the lights on and off and more," says Anselmo. Gwen Casey, owner of Santa Clarita Pet Nanny (362-4939), agrees that at-home pet care has significant advantages. "Your pet stays in its own familiar, secure environment, where all the sights, smells and sounds say 'Home,'" reminds Casey. "There will be no interruption in diet or routine to upset them and no 'travel trauma' caused by anxiety when transporting pets." Another major plus: "With a pet sitter, there is no exposure to illnesses of other animals. You can enjoy your vacation knowing that your pet is safe and comfortable at home," says Casey, a professional sitter. Just like rhinestone collars, at-home care isn't for every pet. If you want your dog to be happy - and your couch to be in one piece - when you get back, boarding your pet may be the best alternative. Contrary to some beliefs, boarding your dog doesn't equate to "puppy prison" - at least not when your furry friend "vacations" at Castaic Canine Camp (257-0957). With 17 pristine acres of fun at their paws, plus play pools, toys, entertainment and new friends (of both the human and animal variety), Fido might even enjoy his stay more than you enjoy yours. "With large gated areas and supervised opportunities to interact with other pets, your dog will get as much exercise as they need. This can really be their home away from home, since we also offer training, daycare and other services," says owner Linda Chisolm. Keep your dog off the asphalt when taking them for a walk - it's hot! Stick to lighter, concrete sidewalks or their favorite - grass. Even if the windows are rolled down, your car's interior temperature can reach over 150 degrees in minutes. Too many good pets lose their lives this way each summer. Never leave your pet in a car! They'll require more water during hot months. Purchase an automatic water system that can be easily connected to a well-shaded spigot. And make sure that your pup isn't penned up. They need a tree, a pop-up tent or some other place to relax away from the blistering sun. 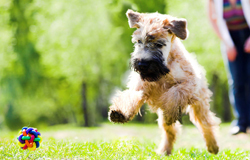 Shaving your outdoor dog does not keep him cooler; he needs his coat to keep him cool and protected in the summer. Don't panic if you pet loses their appetite when temperatures soar. Bring your pets indoors and let them cool off; once they are comfortable they will resume chowing down. Tips courtesy of Marlee Andrews, owner of Dogone-it! Mobile Dog Training & Much, Much More 251-3873.